I’ve been wanting to enter a Whiplash competition for months, and always catch on to it too late. I bought this silk blouse second-hand a while ago for a Wardrobe Refashion project so when the two came together, I realised my time had come. 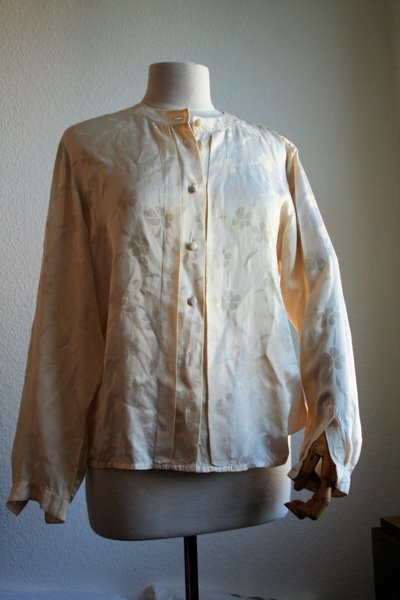 It’s lovely lightweight silk damask blouse with pretty weave pattern. 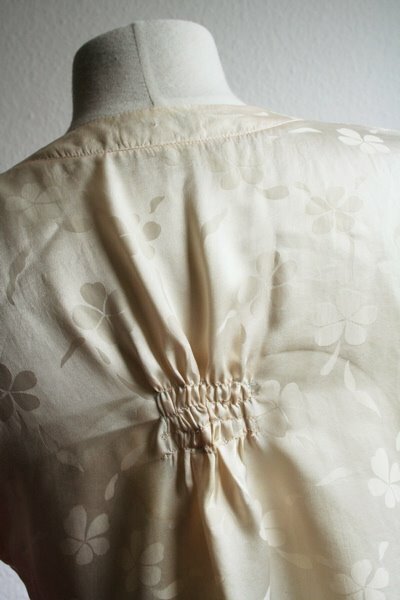 It is lovely to wear – very good quality silk. This is for the deconstruct / reconstruct category. I wanted to do something for the embellish category, as embellishment is very much my thing, but alas, time was not on my side. 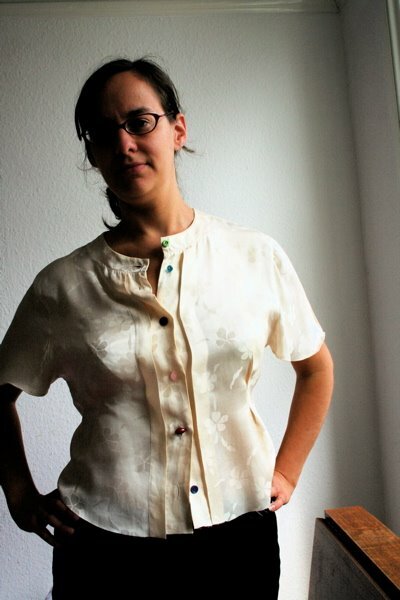 I love the collar and pleats on the placket, but it’s too shapeless and plain for me. So here is the revised version. Short sleeves which come out lovely and floaty because the original sleeves were wide. I’ve cut it down several inches in length and curved the hemline to make it more flattering. It’s been taken in at the side seams and has loose tucks under the bust in place of darts, and lots of new buttons. I like odd buttons, though I am not sure they work brilliantly here. Pretty shell buttons would have been nice, but a bit plain. It probably needs a full set of new buttons, but that wouldn’t have been in the spirit of the thing, so I used what I have. I love the back best. Making the most of the loose fabric, I have created a slight sack-back effect (like my favuourite 18th century clothes) with some rows of gathering. It pleats and swings out nicely at the back now, and is lovely and light to wear. All I need now is for summer to come back! I’m inspired to get on with some other refashioning projects, one of these days, but as always, things for me get put to the bottom of the pile! what an awesome do-over. you’re right, the blouse is gorgeous in that yummy silk. and the finished product looks so floaty. i love the changes you made. and the buttons look lovely. Thanks for the nice comments! I’m reasonably pleased with it, but want to do something better next time. And yes, I teach at the V&A, on and off. Next bag-making courses are in other places – must post about it soon. please let us know about your courses – I’d love to know more!